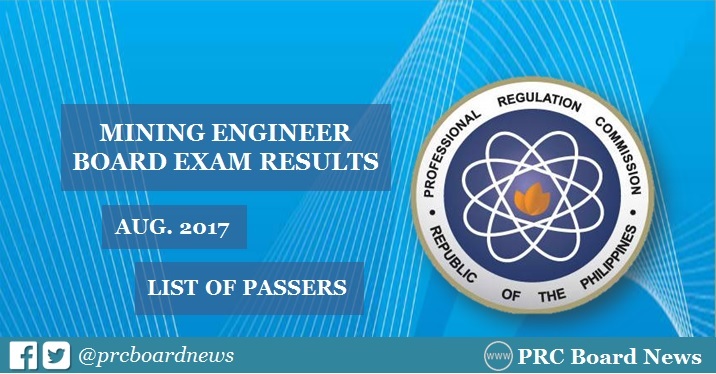 MANILA, Philippines - The Professional Regulation Commission (PRC) officially released on Monday, August 14, the full results of August 2017 Mining Engineer board exam, which includes the list of passers, topnotchers (top 10), top performing school and performance of schools, in two (2) working days after the exam. As advised, 281 out of 317 passed the exams. PRC conducted the Mining Engineer board exam on August 8, 9 and 10 in the cities of Manila, Baguio, Cagayan de Oro, Cebu and Legaspi. Pompeii Nikolai Montealegre Subingsubing of Cebu Institute of Technology (CIT) topped the board with 90.90%. Starting August 17, registration for the issuance of Professional Identification Card (ID) and Certificate of Registration will be done on-line. Please go to www.prc.gov.ph and follow instructions for initial registration. The oathtaking ceremony of the successful examinees in the said examination as well as the previous ones who have not taken their Oath of Professional will be announced later, PRC said. All examinees of the recent Mining Engineer board exam may verify their ratings online through PRC's verification of rating page. Just enter the required information in the appropriate fields to verify your identity. The three-day examination covered mining engineering I, II and III subjects. Mining Engineering I (35%) includes mineral prospecting and exploration, sampling and ore reserve estimation, mining methods, mine planning, designing and developments, ventilation and mine safety, rock mechanics in mining engineering and applied mathematics in mine mathematics. Mining Engineering II (35%) covers mineral economics, mine evaluation and feasibility studies, applied mathematics in mining engineering, mine management and computer application, mine and mineral land surveying and mining law and ethics. Mining Engineering III (30%) includes general geology, mineralogy and petrology, economics geology, structural geology, principles of metallurgy, mineral processsing and assaying and applied mathematics in geology and mineral engineering and ecology. In the August 2016 exams, results were announced online in just 1 working day. PRC named 211 out of 259 who have passed the Mining Engineer Licensure Examination. Saint Louis University (SLU) was the lone top performing school, 80.00% or 48 out of 60 passed the exams. In the August 2015 exams, results were out in 2 working days. A total of 173 out of 214 passed the examinations. University of the Philippines (UP) - Diliman and SLU topped the schools with 97.06% (33 out of 34) and 87.50% (35 out of 40) passed the exams. We are moving but only with the work that will more compatible to use in the all working hours see more details from the movers. That will be about the capacity of the trucks have to for moving every new types of the schedules.